ABU DHABI, Jan 26 2015 (IPS) - With global energy needs projected to increase by 35 percent by 2035, a new report says meeting this demand could increase water withdrawals in the energy sector unless more cost effective renewable energy sources are deployed in power, water and food production. The report, titled “Renewable Energy in the Water, Energy & Food Nexus” by the International Renewable Energy Agency (IRENA), says that integrating renewable energy in the agrifood supply chain alone could help to rein in cost volatility, bolster energy security, reduce greenhouse gas emissions and contribute to long-term food sustainability. The report, launched at the International Water Summit (Jan. 18-21) in Abu Dhabi, examines how adopting renewables can ease trade-offs by providing less resource-intensive energy services compared with conventional energy technologies. “Globally, an energy system with substantial shares of renewables, in particular solar photovoltaics and wind power, would save significant amounts of water, thereby reducing strains on limited water resources,” said IRENA Director-General Adnan Z. Amin. Unfortunately, he said, detailed knowledge on the role of renewable energy at the intersection of energy, food and water has so far been limited. In addition to the water-saving potential of renewable energy, the report also shows that renewable energy-based desalination technologies could play an increasing role in providing clean drinking water for people around the world. Amin said although renewable desalination may still be relatively expensive, decreasing renewable energy costs, technology advancements and increasing scales of deployment make it a cost-effective and sustainable solution in the long term. She said deployment of renewable energy is already showing positive results in the Middle East and North Africa (MENA) region, with an over 50 percent cost share of global desalination capacity. 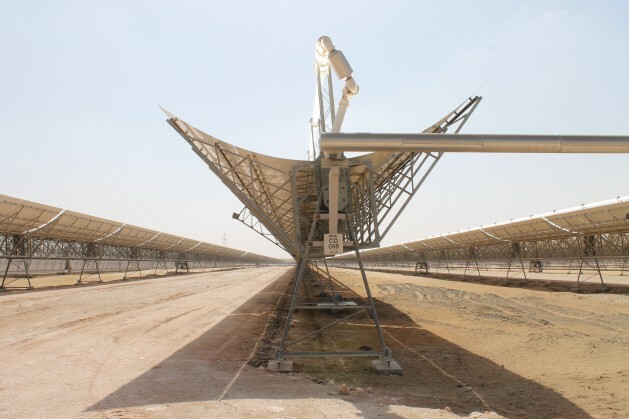 Some 120 kilometres southwest of Abu Dhabi lies the Shams 1 concentrated solar power (CSP) plant, which generates over 100 MW of electricity for the United Arab Emirates national grid. Shams 1, which was designed and developed by Shams Power Company, a joint venture among Masdar (60 percent), Total (20 percent) and Abengoa Solar (20 percent), accounts for almost 68 percent of the Gulf’s renewable energy capacity and close to 10 percent of the world’s installed CSP capacity. Abdulaziz Albaidli, Sham’s Plant Manager, told IPS during a visit to the plant that the project reduces the UAE’s carbon emissions, displacing approximately 175,000 tonnes of CO₂ per year. Located in the middle of the desert and covering an area of 2.5 km² – or 285 football fields – Shams 1 incorporates the latest in parabolic trough technology and features more than 258,000 mirrors mounted on 768 tracking parabolic trough collectors. By concentrating heat from direct sunlight onto oil-filled pipes, Shams 1 produces steam, which drives a turbine and generates electricity. Shams 1 also features a dry-cooling system that significantly reduces water consumption – a critical advantage in the arid desert. “This plant has been built to be a hybrid plant which allows us to produce electricity at very high efficiency, as well as allowing us to produce electricity when there is no sun. Also the use of an air-cooled condenser allows us to save two hundred million gallons of water. That is a very important feature in a country where water is scarce,” said. Morocco is another country aiming to become a world-class renewable energy producer and is eyeing the chance to export clean electricity to nearby Europe through the water, energy and food nexus. Its first CSP plant located in the southern desert city of Ouarzazate, which is now operational, is part of a major plan to produce over 2,000 megawatts (MW) at an estimated cost of nine billion dollars with funding from the World Bank, the African Development Bank and the European Investment Bank. Meanwhile, South Africa is taking advantage of a solar-powered dry cooling system to generate power. In collaboration with Spanish-based CSP technology giant Abengoa Solar, the country is installing two plants – Khi Solar One and KaXu Solar One – that will generate up to 17,800 MW of renewable energy by 2030 and reduce its dependence on oil and natural gas. Dr Linus Mafor, an analyst with the IRENA’s Innovation and Technology Centre, told IPS that there is an encouraging trend across the globe with countries implementing projects that aim to account for the interdependencies and trade-offs among the water, energy and food sectors. He said that the German Agency for International Cooperation (GIZ) is one of the promoters of the water, energy and food nexus in six Asian countries which are integrating the approach into development processes. According to Mafor, such initiatives will see more affordable and sustainable renewable energy deployed in water, energy and food production in the near future. The Austria-based Renewable Energy and Energy Efficiency Partnership (REEEP) is one of the supporters of the nexus among clean energy, food production and water provision. Its Director-General, Martin Hiller, told IPS that understanding the inter-linkages among water resources, energy production and food security and managing them holistically is critical to global sustainability. The agrifood industry, he said, accounts for over 80 percent of total freshwater use, 30 percent of total energy demand, and 12 to 30 percent of man-made greenhouse gas emissions worldwide. REEEP is supporting countries like Kenya, Indonesia, Kenya and Burkina Faso, among others, in developing solar-powered pumps for irrigation, with the aim of improving energy efficiency.